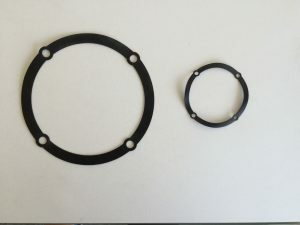 We are now making Custom Laser Cut Neoprene Gaskets, Washers, and Seals at Almax-RP. Neoprene is a synthetic black rubber used in many applications in harsh environments. The Neoprene we use in our gaskets provides a great barrier to mosisture. It has great resistance to oil and oil based solvents. It resists the elements well and is super flexible. Temperature range is from -40f to 230F. Our maximum size is 24” x 24”. We can cut various thicknesses of neoprene depending on your requirements. Standard thicknesses for neoprene rubber are 1/64” to 3/8”. It is very easy for us to produce laser files from AutoCAD drawings. If you have any custom designs you want us to cut, we can do that. Our Tucson, Arizona based manufacturing facility is able to meet your requirements in a cost-effective and timely manner for prototypes or production quantities. Standard lead time is one week or less. 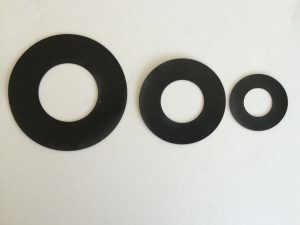 We have no minimum order quantity for neoprene gaskets, washers, and seals. Request a quote or let us know what you are looking for by emailing us at sales@almax-rp.com, calling us at (520) 990-4900, or use our contact form.